Q: I heard a comment that female characters would not appear in the Batman: Brave and the Bold line because it was aimed at boys. Is this true? Is it true for both the BBB line and the Action League line? A: We will get to females in the Action League minis, but not in the 5". I haven't heard anything else since then. As I have now seemingly made this my "obsession" line, I have taken to trolling ebay daily for new auctions (I'm now missing Silver Cyclone, Guy Gardner, Bronze Tiger, Metal Men/Alloy, and Manbat solely due to price [$7.50 is my limit before shipping]). 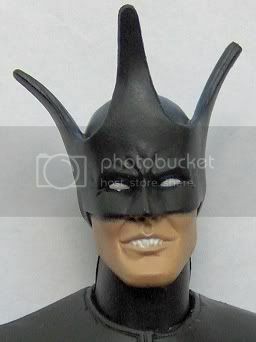 There are currently about a half dozen auctions going for the Orange suited Batman that supposedly ships with Chemo, but no sightings of Chemo as of yet. Hopefully, that will change soon and we will be seeing new cases sent out to stores with the Chemo set. Just an FYI for those that care. Yeah, I'm not counting the Guy/Polaris pack as released until someone actually gets it at retail. It's been awhile since I looked at this thread but I did notice that the Batmobile has been reissued with Blue Beetle replacing Clock King. I'm not sure if Blue Beetle is any different from any of his other versions or not. I saw it at TRU, maybe it is a TRU exclusive. Noticed the Blue Beetle substitute batmobile at TRU also. It is the single release Blue Beetle. Yay! This one finally showed up. Found it today at a Walmart in Phoenix, AZ. There was only one on the pegs, and it was with the same stuff we've seen lately, so I have no idea how many are in the current case. If anyone finds another pack and wants to trade it out let me know. I have not seen these down here yet, but I think once they hit they will be around awhile so I would not worry about hunting them down on eBay just yet. Awesome, it's about time Guy (& Polaris) showed up. Great news about Guy. I saw this picture on ebay yesterday. Following up on my ShopKo post from a few days ago. I was travelling around MN yesterday and stopped at a few Shopko stores. I found 3 Atom figures at one store. Then I saw another set of BatB mini single figures. These were different from the initial series, as these were packed on bubble cards as opposed to the boxes of the first sets.